Some of you guy know me and to the other I say a big hello. I just built and sold a Sandy Bridge 2600k rig. It took me hours and my boss wanted it for his son. Now I have another. 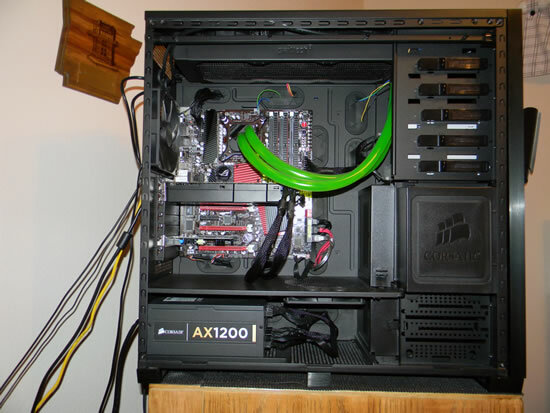 This is a 980X build with a Asus Rampage 3 X58 motherboard. 1200W Corsair PSU, Corsair Obsidian Case, Swiftech H20-330 Edge Cooling Kit, 6gbs of Corsair Dominator Triple Channel RAM DDR3 1866, Vertex 2 120gb SSD and a 1 TB Samsung data drive ( F3) I had enough trouble Overclocking a 9550 Quad, I want this rig to be stable at about 4.0 GHZ. I was hoping you guys could help me. The rig also has 4 opticals , dont laugh, yes 2 of them are my beloved BenQs, on a SIIG IDE controller Card. The other 2 are an Asus Bluray 10X, and a Samsung 223F SATA. Hoping I can be of help to you guys with some stuff also, but Overclocking is not my strong point. See you all in the Overclocking sub forum. Hey Good to see you alan, I saw from your posts at PURE that you where planning the build. Sounds like another beast of a machine. Could you go into your profile and add your computer specs for us so they will show in all your posts. We would love to help you get started in the overclocking and 4 GHz should be relatively easy with that chip and the water cooling kit. Start posting and we will see where we can help. It will be great to see your next new build here with good people to help you out with your OC. Hey Alan welcome to McT's. Good luck with the build and I hope you get some pictures up. Hey alan...post up some pics! Let me know if you have any questions. As you know, I just went through a build with similar components. Glad to see you here as well alan, post away 4GHz is a snap with that chip. Hi alan, thanks we can see the specs now. Do you have the machine assembled and running or just a pile of parts at the moment? Is this one of the rigs that Kipper was selling? Or Stan? Its assembled but I have to tell you I am double thinking this Swiftech H20-330 Edge Kit, Maybe I should have cheaped out and got that Corsair H50 thats all enclosed, I am worried about leaks already. None are there of course but you know me, I should have got an enclosed unit. Yes most of the parts came from Kip and Stan. I am still going to do some other things here, I am getting a 240mb Vertex 3 when they are shipped in a few weeks. What do you have to do here to send a PM and where is Craig, I see him nowhere. Thanks Savage, I will post more pics when I get used to the machine. Hi alan, I edited your post so the image shows rather than just the link to it. Looks sweet by the way. As for PMing folks just click the PM button under any users profile on the left hand side of the page. Don't go re-thinking the cooling alan, as what you have is far superior to any enclosed unit sold! Do you want to overclock now with the smaller drive so it is ready when you get the new drive or do you want to wait till the new drive arrives. I'll PM you about Craig. I haven't heard from Craig in forever I have sent e-mails PM's and never received a response. Ditto, haven't seen him post here in ages. Thanks guys, and I am hoping all is well with Craig, you got me worried now. Thanks Joel for editing my image, and giving me confidence in the cooling system. I am going to OC the CPU not the ASUS GPU. and yes with the smaller drive, I dont know about you guys but my last rig had a 300GB Velosciraptor as my system drive with all my programs and Windows 7 64bit Ultimate and I only used 50 gbs. So 120Gbs should be fine. Are you guys defraging these SSDs, if so what programs are you using? No alan do not defrag the SSD! Is the system up and running or are you still waiting to load the operating system? Give me a second and i will post something for you to read about settingup SSD drives. Have a look at this post for detailed and easy instructions for setting up an SSD drive. smduff wrote: I haven't heard from Craig in forever I have sent e-mails PM's and never received a response. Steve wrote: Ditto, haven't seen him post here in ages. Well thats very worrysome for a guy that was very active, I pray all is well with him, for someone to completely stop posting a a great length of time, it has to be more than computer problems. I hope thats true. Maybe he will stop in and let us know. Hey Alan! Glad to see you here as well. Rig looks great. I ordered the Corsair Hydro Series H60 and it arrive today, but so did I from my annual spring break trip to my parents in Huntsville, AL. May install it tomorrow or Sunday. Wiped out and about to call it a night.